Two days ago my husband and I came back from our trip to Bangkok where we stayed for the last to weeks to visit some of my relatives and friends. We had a great time in Bangkok and since I was born not too far from Bangkok, to me it still feels like my true home! February is also a very good time to visit Thailand in general, for both good weather as better prices ( which have come down a lot after the months of December and January). 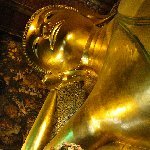 If you have never been to Bangkok make sure to spend at least three, four days because you will find there's a lot to see, taste and experience. From Bangkok you will be just a flight away from the most stunning islands like Ko Phi Phi or Ko Lanta. Did you enjoy Always a good time in Beautiful Bangkok and have you been on a holiday in Bangkok, Thailand? What to do in Bangkok: Shopping! Where to eat in Bangkok: With family, at the market or in the many restaurants you won't have trouble finding.